The eater is back for another rare post to celebrate the return of Restaurant Week. More than 160 restaurants, including some of San Diego’s very best, will be participating in the event from January 16-21, serving three-course menus for $20, $30, or $40, depending on the restaurant. The My Food Geek couple were again lucky enough to be invited for a Restaurant Week preview, and were matched up with Morton’s the Steakhouse located in the Gaslamp District. 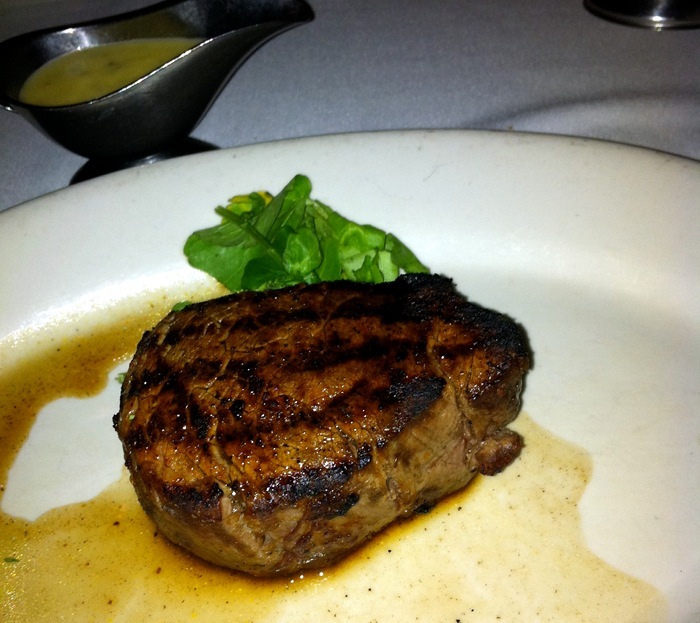 Although a steakhouse is not the type of restaurant we would normally gravitate towards since our food preferences lean towards small portions that are light on meat, we still do appreciate a good steak once in a while, and Morton’s supposedly serves some of the best available. 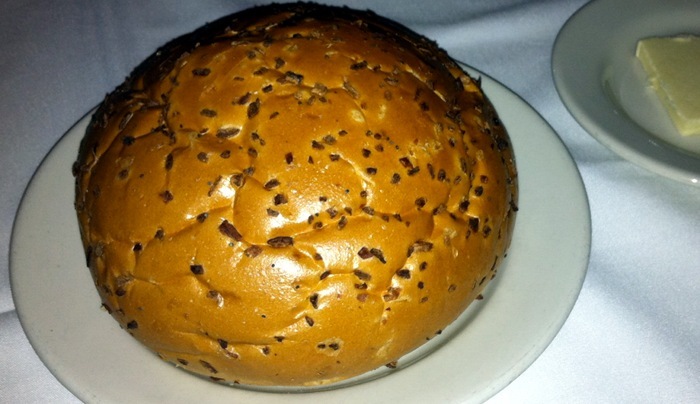 There was a bit of a mix-up with our reservation when we arrived, but the staff were very polite, and once it was straightened out, we were seated promptly, offered drinks, and brought a warm loaf of egg onion bread, which was light, fluffy and delicious. We were feeling a little under-dressed, having both just come in our casual work attire, but that didn’t effect the professional attitude of the army of staff that seem to be working. Our server Mary was very friendly and knowledgeable, and treated us to the full Morton’s presentation of food selection, which I found quite impressive, and included a look at the many prime cuts of meat, as well as an ornery looking ~3 pound lobster. We also heard her interacting with a few other tables near us, skillfully and thoroughly answering their many different questions about the food, including about menu items from many years ago that were no longer offered, but smoothly offering other choices and customizations that would be similar. The Restaurant Week menu included a choice of two different salads. I ordered the Morton’s salad with anchovies, and the geek got the caesar. I was impressed with the blue cheese dressing on mine, because although I like the flavor of blue cheese, I usually find the dressing too heavy, but this dressing was not heavy at all. The anchovies were optional, but I happen to love them, and these ones were particularly good. I’m a little spoiled on croutons since the geek always makes large, olive oil-fried croutons with his caesar salads, and the caesar came with small, traditional, baked croutons, but they weren’t bad, and the caesar dressing was tasty. We both order the single cut filet minion with Sauce Béarnaise, since it seemed a shame to come to Morton’s and not get steak. The other two entree options were Chicken Christopher in Garlic Beurre Blanc Sauce or Broiled Salmon Fillet with Chef’s Sauce Beurre Blanc. We also had the choice of any side they offered, which gave many choices. 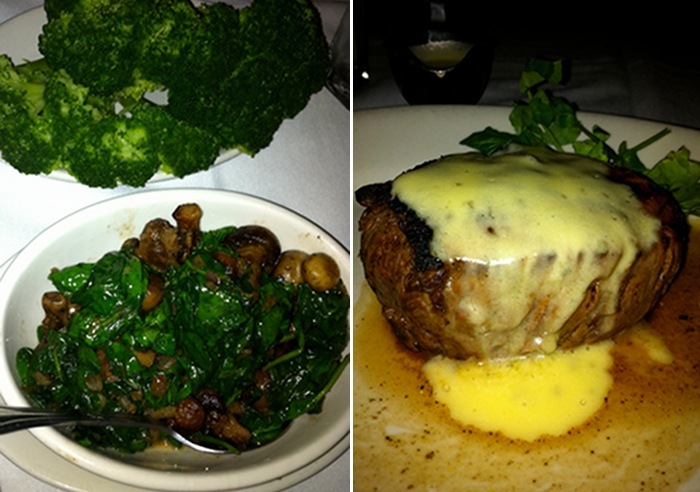 I order the sauteed fresh spinach with mushrooms, and the geek got broccoli with hollandaise sauce. The filet was truly fantastic, in my opinion. It was the tastiest steak I’ve had the pleasure of eating, and the Béarnaise was a delicious accompaniment to it. My only minor complaint was that it came out closer to medium rare than the rare I asked for. I know they would have happily made me a new one more rare if I had mentioned it, but since both rare and medium rare are tasty preparations to me, and I was enjoying it thoroughly as it was, I opted not to mention this. The sauteed spinach & mushrooms were a little heavy on salt, but still very tasty. The hollandaise sauce that came with the broccoli was quite good, and didn’t seem to be separating at all as it sat, which happens so frequently with that sauce. We were shown the whole dessert spread before moving on to the dessert course. The choices for Restaurant Week are Double Chocolate Mousse or Crème Brulee, pretty standard fair. 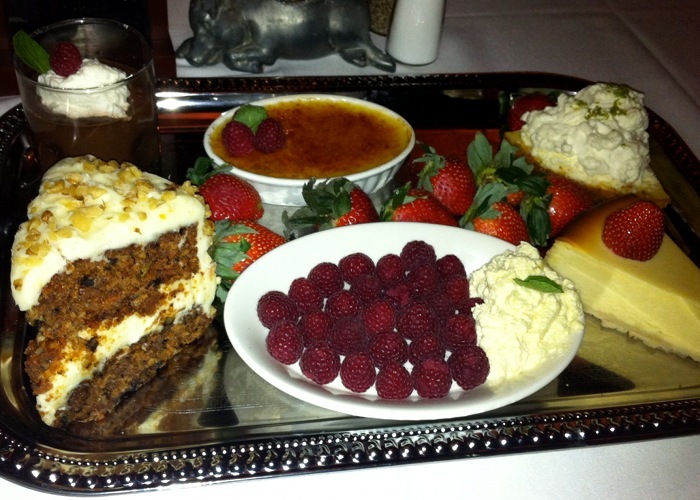 I got the Crème Brulee and the geek got the Mousse. The Mousse was rich and heavy, and little leaning towards a rich pudding rather than a standard mousse. The Crème Brulee was very well prepared, and served in a shallow dish, which I strongly prefer, giving a higher Brulee to Crème ratio! I finished up the meal with a nice cup of decaf. Overall, this was a very good meal, and I would definitely recommend Morton’s to anyone looking for an excellent steakhouse with top-notch service. Restaurant Week gives a great opportunity to try out this high class steakhouse for a discounted price.